I was looking forward to Headless and Raven with great anticipation. Why? 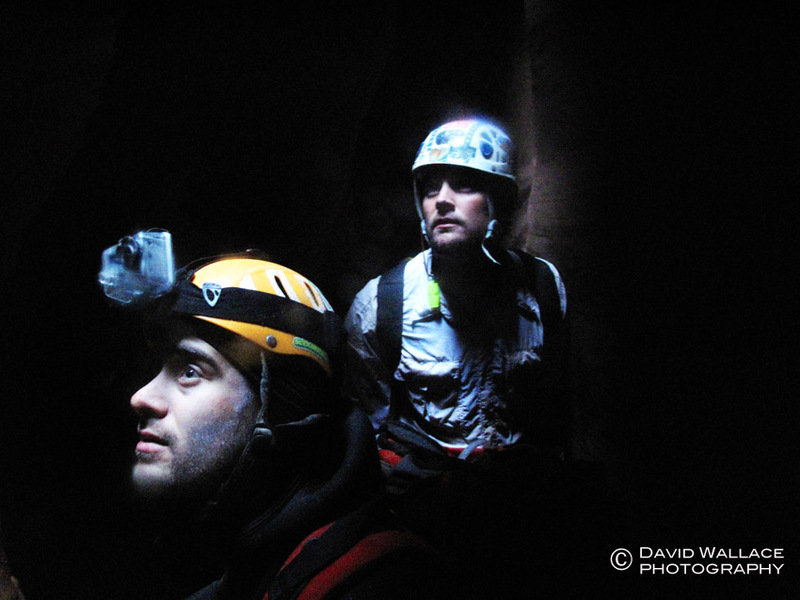 The challenges these canyons would present would be pushing new ground for the members of “Team Quatro”. Though we have dealt with numerous keepers in the past and maybe some even more difficult, Headless Hen’s concentration of potholes was the likes of nothing we had seen. Sure we have tasted high stemming in previous descents but nothing in comparison to what we would face in Raven, spending several hours up to fifty feet off the canyon floor. We went in with a full toolkit and an attitude ready for new challenges and experiences. Headless Hen and Raven are sister canyons but share only the faintest resemblance to each other. Because they are right next to each other requiring the exact same approach and exit and because each one only takes half a day to descend, it is possible to do both in one long day. A giant rock shaped like a hen sans head marked the entrance. 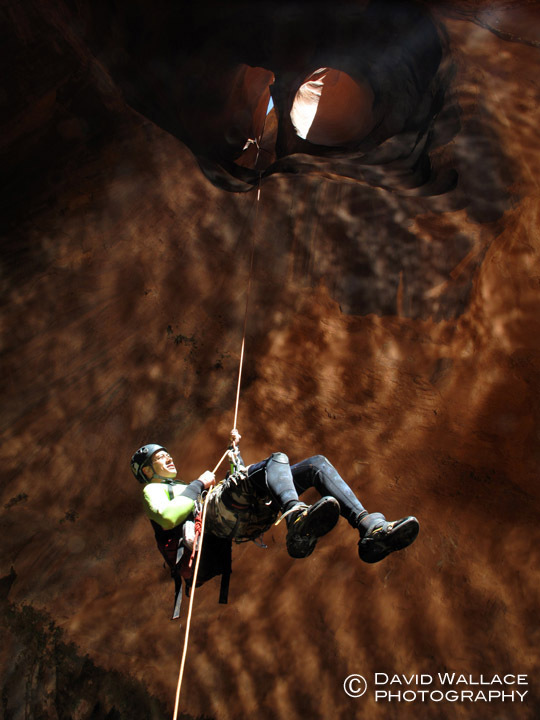 Before the canyon narrowed to the point of commitment, Chris and Eric Luth tested out the Imlay Canyon Gear SandTrap, a tarp like device that can be covered in sand and used as an anchor for rappels and then allows the user to pull the tarp down leaving no traces of the anchor behind. We were very pleased with the results. Quickly the walls came in and we were presented with one keeper pothole after another, some of which were in swimming conditions. We engaged the problems through a combination of buddy boosts and potshot tosses. Potshots, yet another canyoneering specific piece of equipment by Imlay Canyon Gear are small bags that can be filled with either sand or water and then tossed over the lip of a pothole and used as a counterweight to pull yourself up and over the lip of said pothole. The team really found a cohesive groove and we could not have been having more fun under the bright sun with stunning views across the valley to the Straight Cliffs. Some easy high stemming gave us a hint of what was to come later in the day. A fifteen foot jump into a deep pothole was the cherry on the top of this super sweet sundae. After swapping the necessary gear we would need for the different set of challenges we would face in Raven and stashing the gear we didn’t need at the confluence of these two canyons, we marched back up the slick rock to the head of Raven. After a short while Raven got tight and forced us high. Using opposing pressure with my back against one wall and my feet against the other I would work my way down canyon. Eons of wind and water have shaped these canyon walls and as can be expected they are not uniform; that is where things get tricky. At times the canyon walls would flair and undulate in silo shapes forcing you to either extend your body or go higher or lower to keep yourself positioned securely between the walls. A slip would be very costly as you would fall until you got jammed between the ever narrowing walls. We came up with word “crumpelstiltskin” to describe it. 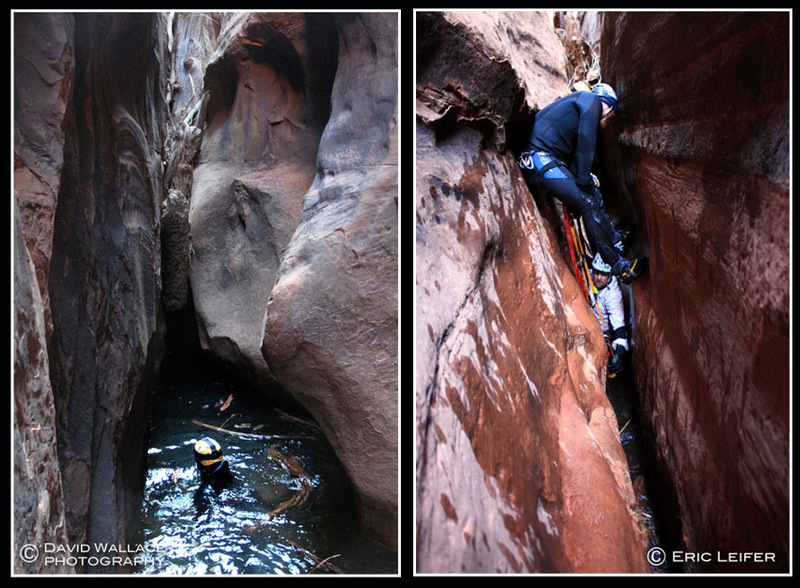 The teamwork necessary to descend a canyon like Choprock or Headless Hen is not as prevalent in this type of canyoneering. You are really on your own. That is not to say that my partners did not provide much mental support during the descent and on one occasion Mike provided me with a belay for a traverse across one of the aforementioned silos, 30 feet above the floor. Mike and Eric did an outstanding job taking turns leading the descent. For three hours we only touched the ground a handful of times. The intensity of the experience was thick requiring total concentration. The climbing moves though not extremely difficult were harder than I expected and any mistake had serious consequences. Fun never fully entered into the equation. 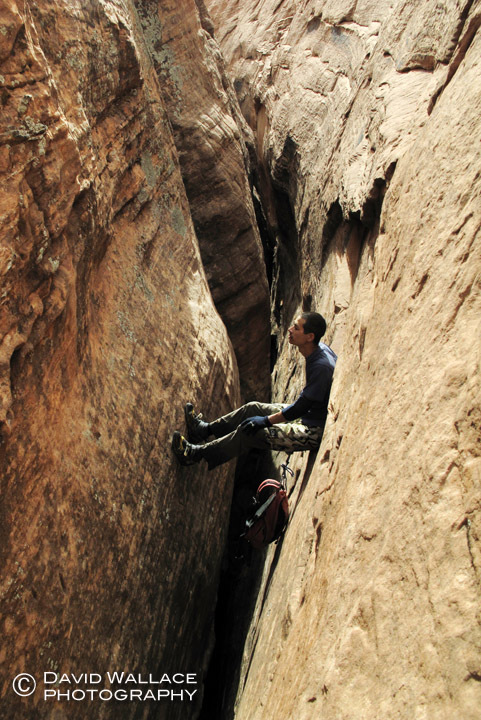 When we emerged out of the final set of narrows the seat of my pants had disintegrated into the canyon walls and my sense of accomplishment was high. Without pants I walked across the the wind swept plateau on the hike back to camp as the sun set. The rest of the team was several hundred yards behind me, giving me an opportunity to decompress and think about the past week, of Laura and my beautiful four month old son, Wyatt. Navajo Mountain loomed large in the distance becoming darker as night took over. Our time is so insignificant relative to that of this place. It makes you realize the importance of being a part of it, even for a little while. Our camp overlooking Chimney Rock. Chris and Eric on the approach to Headless Hen and Raven with Chimney Rock in the background. Across the slick rock navigating towards the Headless Hen rock and into the slot. Eric (left) and Chris test out the Imlay Canyon Gear SandTrap in Headless Hen. It worked awesome. Chris boosts Eric out of a keeper as the other Eric looks on in Headless Hen. Eric stems high in Headless Hen. Chris tosses a potshot as Eric looks on, while working the keepers in Headless Hen. Mike and Eric use a two-man-lift technique to get David out of a keeper. Eric clambers out of a keeper. Eric parts the sludge in a pothole in Headless Hen. Mike taking a breathier 40 feet above the canyon floor in Raven. Eric high stemming in Raven. 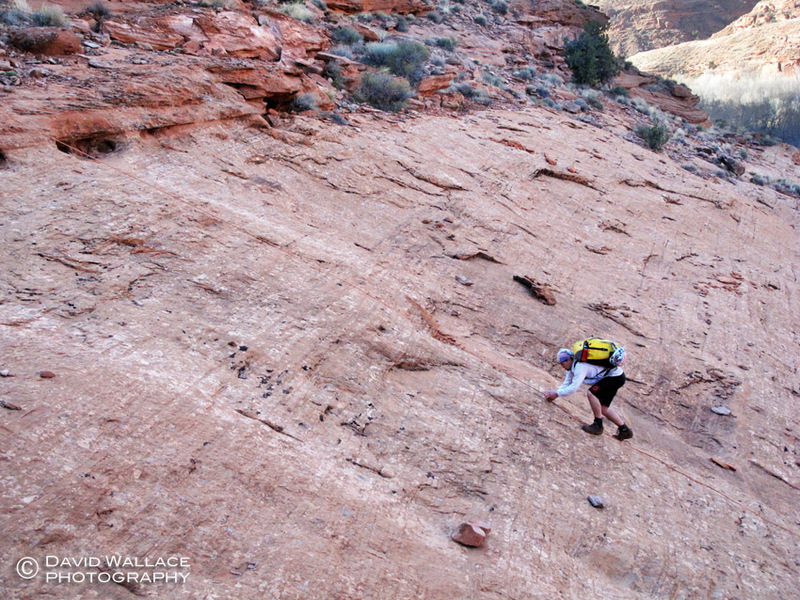 Mike steps around onto a foothold in a silo, 30 feet from the canyon floor of Raven. I would consider this one of the harder moves in Raven. Not much left in the seat of David’s pants left as he watches Eric emerge from the narrows of Raven. Good thing I was wearing a shortie wetsuit underneath. His pants a casualty of Raven, David hikes across the plateau back to camp at sunset with Chimney Rock in the background. We woke the morning following our Choprock descent completely worked. We broke camp and despite the healthy amount of food, canned beer and whiskey consumed, our packs were still way too heavy. The three plus mile hike back to the car was no labor of love, to use the cliche. We hopped in the vehicles and moved on to Chimney Rock, which would serve as our base of operations for the next few days. During the hour drive the stiffness really set in and I started to realize that our plan of doing Raven slot that afternoon and Big Tony the following day was a bit over zealous, at least for me. For those that don’t know, both Raven and Big Tony are slots so narrow at the bottom that the canyoneer must wedge his or her body in the canyon walls up to 50- feet above the floor where the canyon is slightly wider to make passage down the canyon possible. This technique known as high stemming is both mentally and physically demanding and dangerous if a slip or mistake is made. I just did not think I had enough in the tank to do it safely. After a “Team Quatro” meeting we decided to take it down a notch and explore the Dry Forks of Coyote Gulch and then do a Headless Hen and Raven combo tomorrow. Big Tony would have to wait for a future trip. We leisurely set up a beautiful primitive camp a stone’s throw from Chimney Rock and then drove to the trailhead for the dry forks of Coyote Gulch. 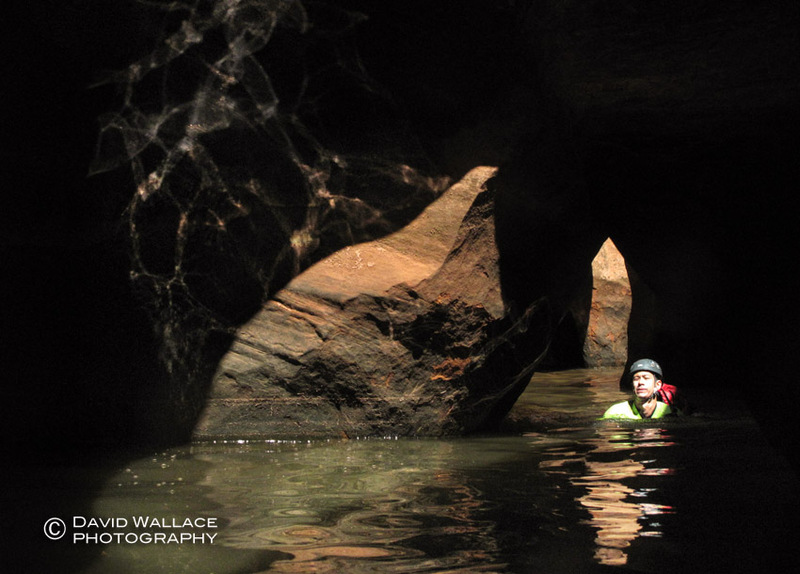 It was nice to be free of ropes, wetsuits, helmets and dry bags as we explored these tight and not so easy canyons for three to four hours that afternoon. I am not sure this would be most people’s definition of a “rest day”, but it was certainly toned down enough for us to recharge our batteries for the intensity about to come. Chris hikes through upper Coyote Gulch. Kyle works his way to the arches in Peek-A-Boo. Chris rounds a bend in Peek-A-Boo. Hiking through upper Coyote Gulch. 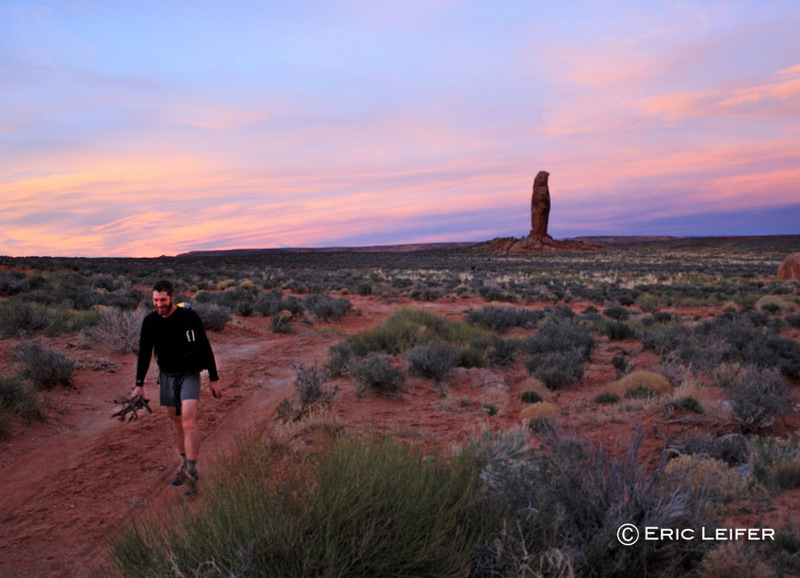 David hikes out of Coyote Gulch. First off lets get some housekeeping out of the way… I have the best wife ever. Planning for this Ecsalane adventure began months before the trip. Realistically, I did not think I would be able to make it with Laura and I being new parents and all. I broached the subject with Laura and she told me that if we could get her mom to come out and visit us in Arizona during the trip I was free to go. This could not have been any easier as Laura’s mom is a first time grandma and has some serious baby fever. As the foray got closer and plans became more detailed I worried that Laura would get jealous that she was not going to be part of it. Keep in mind that Laura is almost as passionate as I am about the sport. On the contrary I saw little if any jealousy, just my wife who was thrilled for me that I was going to do something that makes me so happy. How lucky am I. Now to the first leg of the journey. After a drive up through snowy and muddy conditions we set camp in clearing skies at the Egypt trailhead above the Escalante River. One by one we retired to our tents. The next morning we woke to beautiful conditions and slowly packed the kitchen sink for two nights along the Escalante River. With our packs easily weighing over 60 pounds we staggered across the slick rock like drunken sailors to the confluence of Fence Canyon and the Escalante River. 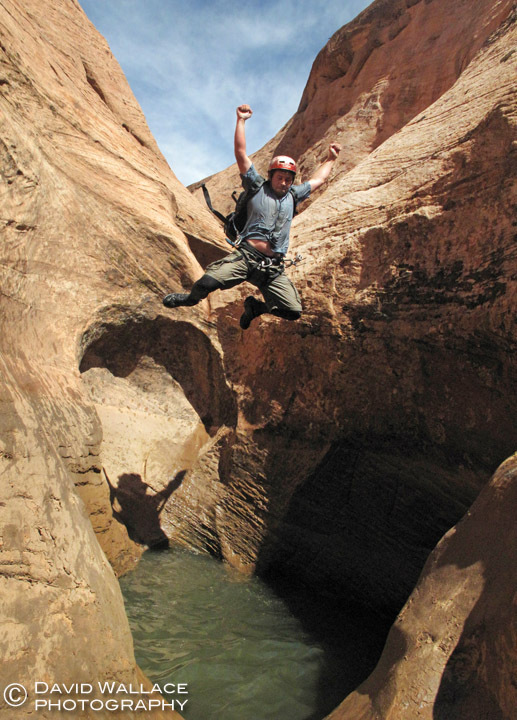 We dropped everything but our canyoneering gear and headed towards Neon Canyon. After a quick stop to examine an impressive panel of ancient rock art mixed with newer “cowboy” art and even newer graffiti, we ascended to the rim of Neon and on to our drop in point. After descending a long stretch of tight narrows we reached our first real obstacle, in a formidable keeper. It appeared that the keeper could be bypassed all together by traversing an exposed shelf and then rapping off a bolt back into the canyon past the pothole. Instead Eric and I thought we would give it a try. We dropped in, swam across the keeper and quickly dispensed of the obstacle with a buddy boost. In the process I was completely dunked underwater. After one really long swim followed by a few shorter ones, we reached a room where Eric Luth poignantly said, “Wow! How many f—ing holes are there? !” We played in the small arches and chambers using one to create surreal echo sounds. Immediately after this the infamous keeper pothole was disguised underwater allowing us to slide into its depths and easily escape the other side. Just beyond was the main event, the Golden Cathedral, which from above is completely unrecognizable to the stunning sculpture that it is. Giddy with excitement we rigged the rappel and one by one down we descended into the shimmering golden light that was quickly moving across this epic room. Shortly after all six of us got our turn, the light moved on leaving us in the bland and flat shadows of the canyon walls. If we were any later we would have missed this spectacle of light. In the lack of sun I was getting chilled so I hightailed it back to camp to get in some dry and comfy clothes. Next up Choprock. With enormous packs for two nights and three days along the Escalante River, Eric (left) and Chris begin the hike down to the river. Ancient rock art on a panel along the Escalante River near the confluence with Neon Canyon. The narrows of upper Neon. Eric climbs out of a keeper with the aid of an etrier attached to Eric. Mike working during a long swim. (From left) Eric, Kyle and Chris. Chris swims across the infamous keeper, filled to the brim with water as Eric slides in. Kyle raps the Golden Cathedral. Mike raps the Golden Cathedral. Eric raps the Golden Cathedral as Mike and Kyle look on. Chris gets off rope after the Golden Cathedral rappel. With luck, hard work and an open heart life can be really amazing. 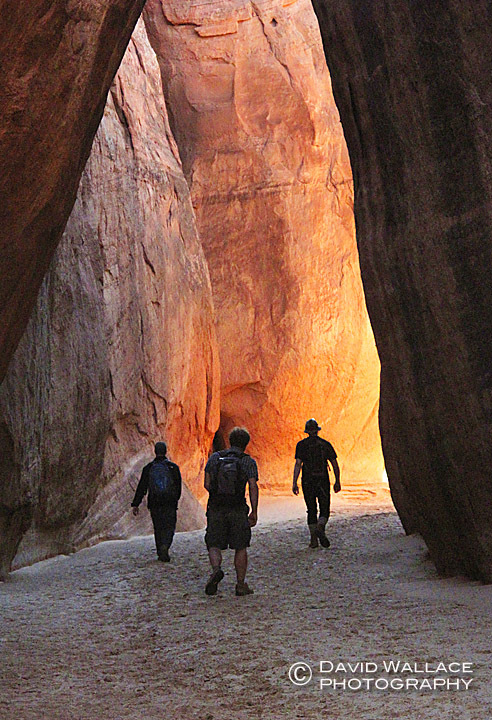 The exploration of canyons in a raw, rugged and isolated place like the Grand Staircase Escalante National Monument is a featured showcase of the potential of our short time on this planet. 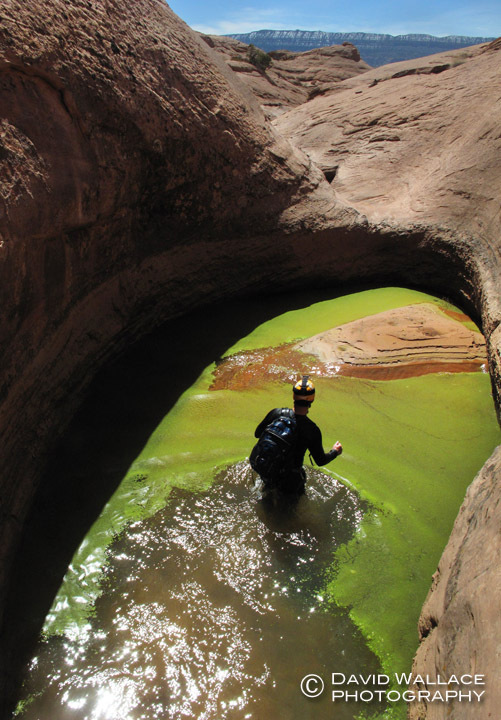 On a six- day trip in late March, the newly created “Team Quatro” ventured into the depths of Neon, Choprock, Coyote Gulch, Peek-A-Boo, Spooky, Headless Hen and Raven canyons. As within our lives as a whole, during this expedition we experienced history, camaraderie, teamwork, concentration, beauty, intensity, challenge, fear, fun, surprise and pain. Over the course of the next week we will take a look at this journey. Above is a beautifully documented video shot by Mike Schennum and Eric Luth with editing by Mike that offers a sneak peak into the trip. Stay tuned.